Orange cordial is something I find very thirst quenching but hardly ever buy. The amount of sugar, colourants and other preservatives most contain scares me somewhat; even the brands marketed as healthy have an ingredients list that surely baffles all but the most food aware and scientific consumers out there. What with Christmas around the corner I began to face a dilemma; with a family who enjoy using orange as a mixer or just for an easy drinking soft drink I had a choice to make — buy a more ‘reputable’ brand, have everyone go without, or make some. It stands to reason then that I decided to make my own. There is nothing complicated about making cordials, they are in fact simpler than making jams and other preserves, the easiest of the bunch; as you don’t have to worry about setting points, pectin or anything more troubling than making sure you sterilise your bottles. The simplest way to do this is to put them through the dishwasher on the hottest cycle but should you not have a dishwasher or not want to use that method, more information on how to sterilise bottles and jars can be found here. The upside of this easy kitchen activity however is that friends and family will ooh and ahh, thinking you to be a true domestic god/goddess when they see the bottles of goodies you’ve produced. I used Christmas oranges (A.K.A clementines) to make this cordial as I’d a fruit bowl full of them and they are at the height of their season. I’m not very good at just eating fruit au natural in winter, I have to preserve or cook it in some way for me to get my daily intake; in summer however I’m happy enough to munch away as either a snack or dessert — happen it’s the cold weather than does it. 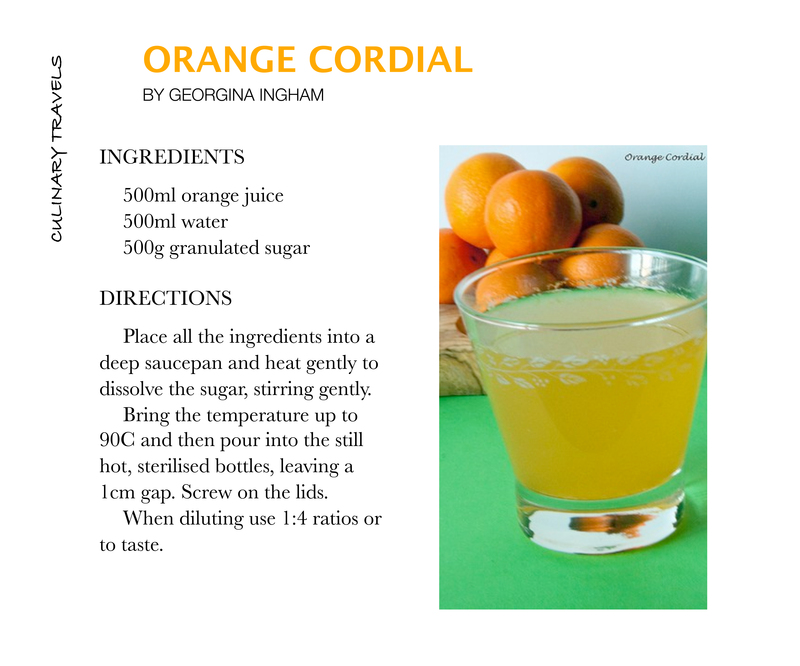 Orange cordial can be simply added to still water, mixed with sparkling water or lemonade for a soda style drink, used as a mixer for alcoholic drinks such as vodka or whiskey or can even be added to hot water for a winter warmer. The traditional story is that the clementine was originally an accidental hybrid said to have been discovered by Father Clément Rodier in the garden of his orphanage in Misserghin, Algeria. However, there are claims it originated in China much earlier, being virtually identical to the variety known as the Canton mandarin widely grown in Guangxi and Guangdong Provinces in China. Clementines are the smallest and sweetest variety of tangerine, they are both sweet and tangy, contain no seeds and are recognisable by their loose, baggy bright orange skin. Surprisingly clementines are actually very juicy. Strange as it may sound, cordials actually make good Christmas gifts. Bottle them up in a nice fancy way, write a personalised message on the tag and away you go. So that’s a Christmas tip – reduce the stress and give some home made goodies as gifts; trust me they are always appreciated and go down well. I am entering this article to The Twelve Days of Christmas Cooking Tips event over at The Cotswold Food Year and the Recipe Advent Calendar over at Lexiophiles.